CNC processing is widely used in different industrial because of its high quality and precision. CNC wire cutting process which is the last working processing of the most machining workpiece. In general, it is difficult to make up when the workpiece is deformed, therefore. 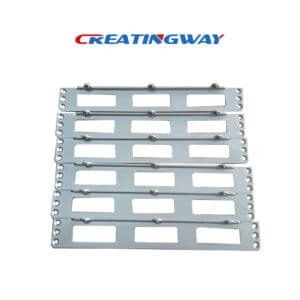 It is necessary to take corresponding measure in the process and make the cutting route reasonably, thus reduce the deformation of the workpiece. Do not machining along the end face of the workpiece. If so, the electrode wire is subjected to the electric spark impact, thus lead to the electrode wire to run unsteadily and can’t ensure the size and surface precision of the workpiece. Do not process from outer surface of the workpiece, because it will directly damage the strength of the workpiece to cause the deformation. Using a blank to cut two or more parts, not should cut continuously, but to start machining from different threaded holes. It is better to arrange the segment of the workpiece and the clamping part at the end of the cutting process. In addition to this, the deformation of wire cutting is also related to wire electrode. The electrode wire needs to have good electrical conductivity and corrosion resistance and high tensile strength. In general, we will choice molybdenum wire as electrode wire when CNC wire cutting. Of course, the diameter of electrode wire should be selected according to the width of the slit, the thickness of the workpiece and the size of the corner. When machining some small models with sharp corners and narrow stitches, we should choice thinner electrode wire to finish them; when machining large thickness workpiece or large current cutting, the thicker electrode wire should be selected.